Eric Allin Cornell (born December 19, 1961) is an American physicist who, along with Carl E. Wieman, was able to synthesize the first Bose–Einstein condensate in 1995. For their efforts, Cornell, Wieman, and Wolfgang Ketterle shared the Nobel Prize in Physics in 2001. Cornell was born in Palo Alto, California, where his parents were completing graduate degrees at nearby Stanford University. Two years later he moved to Cambridge, Massachusetts, where his father was a professor of civil engineering at MIT. Here he grew up with his younger brother and sister, with yearlong intermezzos in Berkeley, California, and Lisbon, Portugal, where his father spent sabbatical years. In Cambridge he attended Cambridge Rindge and Latin School. The year before his graduation he moved back to California with his mother and finished high school at San Francisco's Lowell High School, a local magnet school for academically talented students. After high school he enrolled at Stanford University, where he was to meet his future wife, Celeste Landry. As an undergraduate he earned money as an assistant in the various low-temperature physics groups on campus. He was doing well both in his courses and his jobs in the labs and seemed set for a career in physics. He however doubted whether he wished to pursue such a career, or rather a different one in literature or politics. Halfway through his undergraduate years he went to China and Taiwan for nine months to volunteer teaching conversational English and to study Chinese. He learned that this was not where his talents lay, and returned to Stanford with renewed resolve to pursue his true talent - physics. He graduated with honors and distinction in 1985. For graduate school he returned to MIT. There he joined David Pritchard's group, which had a running experiment that tried to measure the mass of the electron neutrino from the beta decay of tritium. Although he was unable to determine the mass of the neutrino, Cornell did obtain his PhD in 1990. After obtaining his doctorate he joined Carl Wieman at the University of Colorado Boulder as a postdoctoral researcher on a small laser cooling experiment. During his two years as a postdoc he came up with a plan to combine laser cooling and evaporative cooling in a magnetic trap to create a Bose–Einstein condensate (BEC). Based on his proposal he was offered a permanent position at JILA/NIST in Boulder. For synthesizing the first Bose–Einstein condensate in 1995, Cornell, Wieman, and Wolfgang Ketterle shared the Nobel Prize in Physics in 2001. 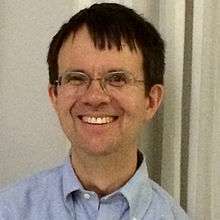 He is currently a professor at the University of Colorado and a physicist at the United States Department of Commerce National Institute of Standards and Technology. His lab is located at JILA. He was awarded the Lorentz Medal in 1998 and is a Fellow of the American Association for the Advancement of Science. He was elected a Fellow of the American Academy of Arts and Sciences in 2005. Cornell married Celeste Landry in 1995 mere months before the BEC experiment succeeded. Their first daughter, Eliza, was born in 1996, and their second daughter, Sophia, in 1998. In October 2004, his left arm and shoulder were amputated in an attempt to stop the spread of necrotizing fasciitis. He was discharged from the hospital in mid-December, having recovered from the infection, and returned to work part-time in April 2005. 1 2 3 4 5 6 't Hooft, G. (2001). "Eric A. Cornell - Autobiography". Nobel web. Retrieved 2010-03-22. ↑ "Book of Members, 1780-2010: Chapter C" (PDF). American Academy of Arts and Sciences. Retrieved 10 April 2011. Frängsmyr, Tore (2002). 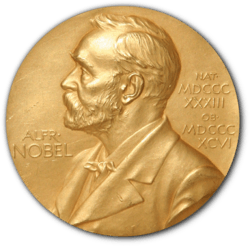 Les Prix Nobel: The Nobel Prizes 2001. Stockholm: Nobel Foundation. Retrieved 2007-09-19.